We have been reporting on the story of expat teachers in Kuwait as it unfolds, following the decision of the Civil Service Commission to slash their monthly housing benefits from KWD 150 to 60 “for austerity measures.” Expatriate teachers have voiced their objections to local press, ministry officials, and their countries’ embassies. 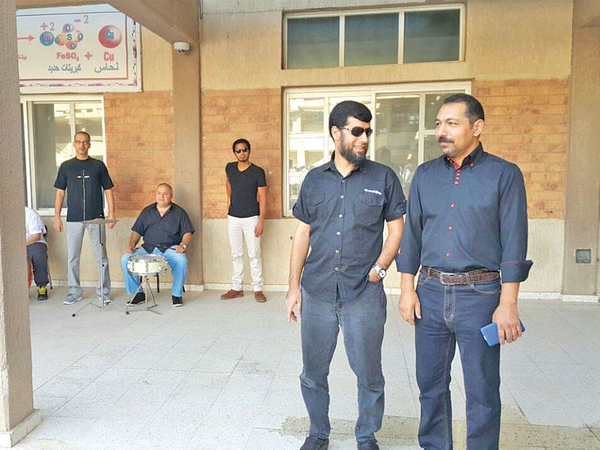 A hashtag on social media called on teachers to dress in black to express their rejection to this violation of their contracts. The teachers promise to organize a strike if the decision is not overturned. The country’s blue-collar workers are also protesting: about one hundred Bangladeshi workers demonstrated in front of their embassy, demanding residency permits that their company failed to provide them with. The workers were brought over by a Kuwaiti company to work as guards, but they have not been paid for the past two months. They also lack access to housing and are forced to work street jobs to get by their days. The workers are demanding that their visas be transferred to another employer so they can resume their lives. Last month, Kuwait had announced tighter restrictions on the recruitment of “male workers from Bangladesh.” The ministry said the new ban was made upon reviewing the high number of Bangladeshi workers in the country. “We want a transfer as soon as possible because we do not have any place to live. We have no money too, and are forced to work elsewhere. We are very afraid, as the police could check our residency status, and we can end up in jail,” one worker told Kuwait Times reporter. The embassy said that the company could not process their residencies due “to problems with the ministry” which could possibly mean that the employer has committed a violation in recruitment practices (like trading on visas) that required a ministry investigation and a hold on their papers. Meanwhile, the workers have been stranded for a year without legal papers necessary to keep them safe from arrests and protect their wages. In another story, a group of construction workers in Al-Abdily protested at the worksite demanding an investigation of the death of their co-worker. The ministry paid a visit to the worksite, only to state that all conditions are safe and the “death was natural.” The ministry’s inspector admits that the ambulance vehicle of the worksite was not available when the worker had a heart attack, and the ambulance called in arrived only after his death. The site’s ambulance is supposed to be available at all times but “the driver was not there at the time.” Nevertheless, the ministry sees no violation in this incident, saying the protest came out of “worry and panic,” rather than dangerous conditions or ill treatment.